From Goodreads: Godspeed was fueled by lies. Now it is ruled by chaos. It’s been three months since Amy was unplugged. The life she always knew is over. And everywhere she looks, she sees the walls of the spaceship Godspeed. But there may just be hope: Elder has assumed leadership of the ship. He’s finally free to enact his vision – no more Phydus, no more lies. But when Elder discovers shocking news about the ship, he and Amy race to discover the truth behind life on Godspeed. They must work together to unlock a puzzle that was set in motion hundreds of years earlier, unable to fight the romance that’s growing between them and the chaos that threatens to tear them apart. In book two of the Across the Universe trilogy, New York Times bestselling author Beth Revis mesmerizes us again with a brilliantly crafted mystery filled with action, suspense, romance, and deep philosophical questions. And this time it all builds to one mind-bending conclusion: They have to get off this ship. So… I’ve been sitting on my thoughts regarding A Million Suns for a few days, and this is still a difficult recommendation for me to write. Why? Because there was just SO MUCH I loved about this book. Sure, it probably had a few flaws (what book doesn’t? ), but I completely missed them because I was so wrapped up in the tension and suspense and twists and turns on every. Single. Page. Now, I worry that this post will come across as an incoherent gushfest. First, let me say that I very much enjoyed the first book in this trilogy, Across the Universe. In fact, it was among my favorite releases of 2011, and certainly one of the best books I read by a debut author (Go, Beth!). 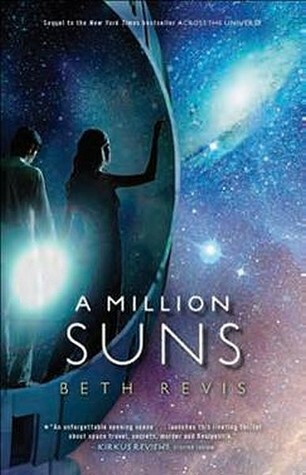 That said, in my opinion, A Million Suns is a stronger, more exciting, more layered story. There’s just so much going on, and the best part is that it all comes together at the end in a way that is absolutely brilliant. Seriously. I want to reread the entire novel just so I can find all the clues and hints that failed to register as clues and hints the first time around. 1) The Characters – Amy rocks, quite simply. She’s a strong, smart girl who doesn’t take crap from anyone, but she’s still a girl, a girl I’d love to be friends with. And Elder is so much more than the typical YA boy. He’s got weaknesses and flaws and tons of self-doubt, but he’s also honest and caring and incredibly noble. His character arc was one of my favorite aspects of A Million Suns. 2) The Writing – Beth is one of those authors who makes reading effortless. Her words and sentences and scenes are stunning and they do their jobs without pretension or heaviness. A Million Suns is a hefty book, but I flew through it. 3) The Suspense – Nothing on Godspeed is as you think. There are surprises behind every door (literally), and no one’s allegiance can be trusted. I felt my jaw drop more than once, and I found myself thinking about this book and its characters, trying to work out the mysteries even when I wasn’t actively reading. 4) The Backdrop – Goodspeed is one of the coolest settings I’ve come across. In this installment of the trilogy, the dystopian aspect of living on a completely isolated spaceship with just over 2000 people really comes into play. The way Beth portrays crowd mentality and a possible uprising is fascinating. I’m happy to report that A Million Suns does NOT suffer from the dreaded Middle Book Syndrome. It is a story very much its own, one with a conclusion that was satisfying yet still left me DYING to read Shades of Earth, the final book in this series. If you love dystopian, science fiction, romance, or any combination thereof, you simply MUST read A Million Suns! Tell me: What are YOU reading this week? Ooh, thanks for the review! I loved Across the Universe, so it’s great to hear that you thought the next installment was even better. I definitely did! It really made me fall for Elder, and I was literally on the edge of my seat at times! SMOKE AND BONE is amazing! And yes, definitely pick up AtU and AMS when you’re off your book buying hiatus. They’re book well worth owning. Thanks, Pam! Yes, AtU definitely left me wanting more as well, so I was very happy to learn that AMS delivered. Hope you enjoy it too! Sounds great–although I skimmed your review because I haven’t read ACROSS THE UNIVERSE yet. Middle books are so tricky–it’s awesome that this one was so good. I tried my best to keep it spoiler-free (as always! ), but you’ll have to let me know what you think if you decide to give AtU and AMS a read. I think they’re both so well done! Lucky, lucky with your B&N gift card! Let me know what you think when you get to AMS… hopefully you’ll love it as much as I did. And again, welcome to the Bookanistas, Tracy! Across the Universe was already on my TBR pile (especially after seeing it pop up in so many places in the YA 2011 Superlatives Blog Fest!). So now I’m really anxious to get to it, knowing the second one is equally good. Thanks for the review! I’m dying to read this…I LOVED AtU! I bet you’ll love AMS too then, Jess. Let me know what you think! Great review! Not an incoherent gushfest at all. I just finished THE FUTURE OF US, which you recommended, and am starting on CHIME. I WANT THIS BOOK! I loved Elder and Across the Universe, and knowing that this book doesn’t lag the way middle books tend to do is WONDERFUL. I can’t wait to read this! I loved Elder in AtU too, Rida, but I loved him EVEN MORE after reading AMS. Hope you love it as much as I do!